“The lab is really one of the largest service laboratories in the university system,” said Brian Barber, director of the Soil Testing and Research Analytical Lab. Barber took over the lab six years ago, and in that time tripled the amount of samples going through the lab. He said this renovation will help improve their efficiency even more. Technicians now have a better work flow, plus new and better equipment. The Soil Testing and Research Analytical Lab employs six full-time scientists and two part-time scientists. Six to ten students are also employed at the lab. Funding for the renovation came from the legislature through the Education, Extension and Technology Transfer Program (AGREETT). Equipment upgrades were generated by the lab itself, the University of Minnesota and grant writing. The Minnesota Soybean Research and Promotion Council was involved in several aspects of this renovation. Find the full article at Minnesota Farm Guide later this month. Original interview and write-up by Peter Scharpe. You can find more information at soiltest.cfans.umn.edu. 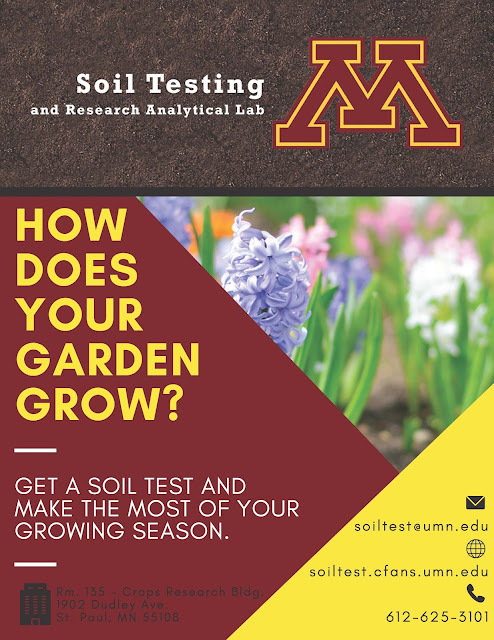 For more information, you can check out their website, email soiltest@umn.edu, or call 612-625-3101.